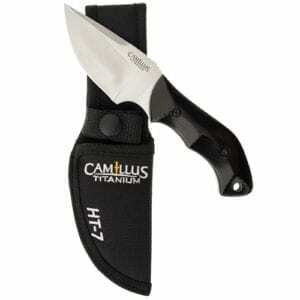 The Camillus HT-7 7” Fixed Blade Knife with a 3.25” Blade made of hard and strong 420 steel, provides the user a good balance of the most desirable traits for knife steel. The handle made of Rubber and ABS allows for durability and strength, while also having resistance to extreme temperatures. The handle also has a lanyard hole built-in. Included is a Ballistic Nylon Sheath to protect your blade from debris and other foreign materials. Lifetime Warranty.